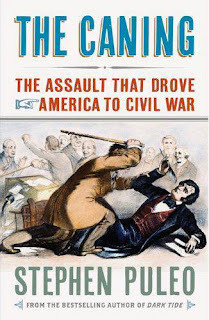 Following are some items that were mentioned during the 31 January 2013 Fieldstone Common interview with Stephen Puleo, author of The Caning: The Assault that Drove America to Civil War. The podcast of the interview is now available. Stephen Puleo is a writer based in Massachusetts. You can learn more about him at his website and you can follow him on Facebook. The book The Caning: The Assault that Drove America to Civil War, published by Westholme Publishing, is available for purchase from major books sellers online and off such as Amazon.com. The Caning occurred on May 22, 1856 when pro-slavery Congressman Preston Brooks attacked staunchly anti-slavery Senator Charles Sumner. The beating stopped just short of taking Sumner’s life. To learn more about Charles Sumner you can read his biography, Charles Sumner and the Coming of the Civil War by David Herbert Donald. You can learn more about Preston Brooks from his wikipedia page. Westholme Publishing, the publisher of The Caning: The Assault that Drove America to Civil War, donated two copies of the book. One was given as “door prize” during the live show and went to a listener in Pennsylvania. The other copy will go to a listener who has signed up for the Fieldstone Common mailing list (to be announced Tuesday night). A big thank you to Westholme Publishing for their generosity! To see the Heirloom Registry entry — including photos — for the radio, visit www.heirloomregistry.com and enter registration number: SNTS-256-996-3497-2012. 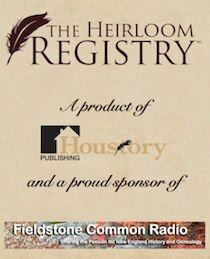 Fieldstone Common’s sponsor is Houstory, makers of the Home History Book and the Heirloom Registry. Fieldstone Common listeners can take 15 % off their Heirloom Registry order by visiting the Heirloom Registry at www.heirloomregistry.com, and entering FIELDSTONE – in all caps – at checkout. Fieldstone Common greatly appreciates the support of Houstory as a sponsor. 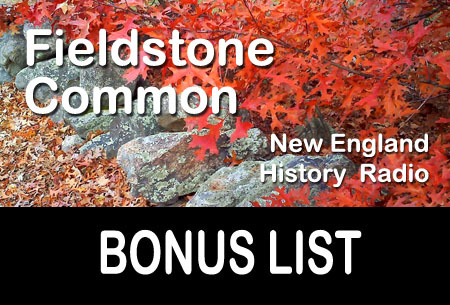 Show your support for Fieldstone Common by visiting our sponsor’s site. This week on Fieldstone Common, Marian Pierre-Louis interviews Stephen Puleo, author of The Caning: The Assault That Drove America to Civil War. One of the most shocking and provocative events in American history, the caning convinced the North and the South that the gulf between them was unbridgeable and that they could no longer discuss their vast differences of opinion regarding slavery on any reasonable level. The Caning: The Assault That Drove America to Civil War tells the incredible story of this transformative event. While Sumner eventually recovered after a lengthy convalescence, compromise had suffered a mortal blow. Moderate voices were drowned out completely; extremist views accelerated, became intractable, and locked both sides on a tragic collision course. The caning had an enormous impact on the events that followed over the next four years: the meteoric rise of the Republican Party and Abraham Lincoln; the Dred Scott decision; the increasing militancy of abolitionists, notably John Brown’s actions; and the secession of the Southern states and the founding of the Confederacy. As a result of the caning, the country was pushed, inexorably and unstoppably, to war. Many factors conspired to cause the Civil War, but it was the caning that made conflict and disunion unavoidable five years later. 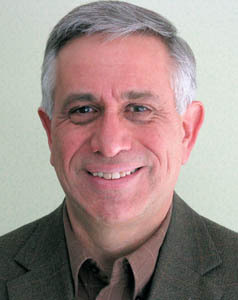 STEPHEN PULEO is the author of five books, including the bestselling Dark Tide: The Great Boston Molasses Flood of 1919 and Due to Enemy Action: The True World War II Story of the USS Eagle 56. A former award-winning newspaper reporter and contributor to American History and other publications, he holds a master’s degree in history and teaches at Suffolk University in Boston.